A bad olive harvest in Europe could mean an increase in olive oil fraud, the Canadian Food Inspection Agency (CFIA) warns. The agency is launching a special project to crack down on this particular food fraud by sending agents to sample olive oil across the country and test it to ensure it isn't cut with cheaper oils, as an example. Aline Dimitri, the CFIA's deputy chief food safety officer, explained the project and some of the CFIA's new fraud-fighting tools when she appeared on CBC Radio's Ottawa Morning. "Olive oil has been on our radar for many years. 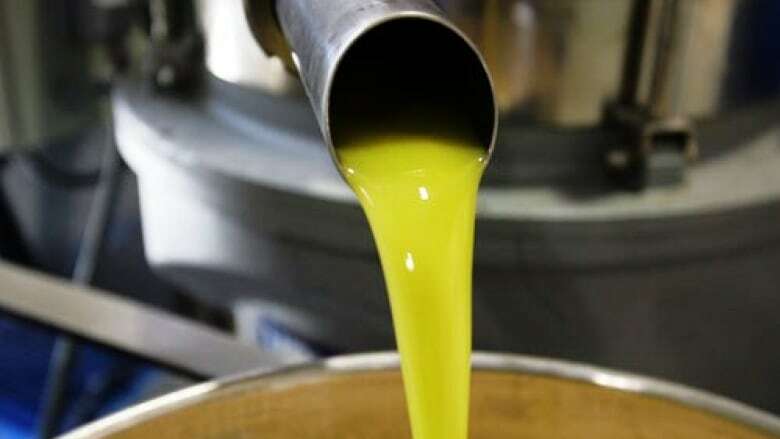 We in fact direct our inspectors to pay particular attention to olive oil when they are in a distribution centre or in an importer," she said. "The real problem is, what if it's cut with peanut oil, and someone is allergic to it and they do not know it is in there? That is why we keep our eyes out, that's why our inspectors are very vigilant and why once in awhile we do these bigger projects." CFIA inspectors have the power to order lab tests for any oil they suspect may be fraudulent. If the agency finds any wrongdoing, it can have the product relabelled, force an importer to hold the product, or recall a product from store shelves entirely, among other things. In January, a new law came into effect that gives the agency broader powers. "Now we have a mandatory traceability. Every person who sells a product that is food needs to know where they bought their ingredients from and where they sold it," Dimitri said. "It allows products to be removed from shelves even faster if needed." The CFIA is asking anyone with possibly fraudulent oil to contact the agency online or by phone so it can investigate.